This past weekend, I finally cleaned my master bathroom, I couldn't fight it any longer. So, in an effort to motivate myself, I decided to give it a slight face lift. We painted it a few months ago, but only installed a new mirror and fixtures, I even reinstalled the old shower curtain- I was craving something different. I don't know about you, but I am so ready for spring. I decided what my blue bathroom needed was a pop of yellow, the color of spring. I started off with some flowers from Michael's, and added them to a vase I already had. The flowers were $4.99/stem, 40% off, so for the bunch I paid $14.97. I love the scattered, wide array they are in, I think it makes them look real. This of course is pinterest-inspired, using a cake stand for products. I picked this one up at TJMaxx for $5.99. I really wanted the larger square, but they only had circles in the larger size. I stuck with only keeping out the essentials, you know, like spray deodorant. I may be like the last person on earth who uses it, but I love it. I went with natural deodorant for awhile, but Tom's irritated my skin, and Alba made me smell funky, and I'm NOT a sweater, believe me. TMI? I am a bit of a snob when it comes to my hairspray, I only use Paul Mitchell Hold Me Tight finishing spray. It sprays a light mist, always evenly, and smells divine. If you're looking for a stronger hairspray, I don't recommend this. I like to spray a bit after I blow dry or style my hair, just to keep the fly aways under control. There's no frills when it comes to this cabinet, I just was happy to find a basket at Target for $3.77 (& 5% off with my card) to hold all our medicines, band-aids, coughdrops, etc. They were all over the top shelf and kind of giving me anxiety! And yes, the open bottom shelf mainly contains my manicure essentials- cotton balls for removal, clippers, nail brush, and pedi supplies. My husband picked up the cabinet at Goodwill last year for $17, a good cleaning later and I'm in love. I'm sharing this photo from Target as the curtain hanging in my bathroom is hard to see. 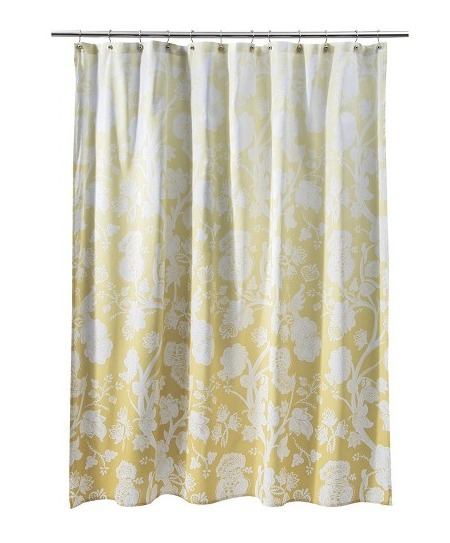 I LOVE this curtain, and figured at $19.99 (minus 5% card discount,) it was worth it. The ombre pop of yellow brightens the bathroom, and also allows more light into the shower than the purple and silver one that was there before. All in all, I spent $43.53, and my bathroom has a brighter, cleaner look to it. I have yet to hang any decorations on the wall or replace the floor, but until it is determined we're staying or moving, I am avoiding putting holes in the walls or investing for tile. Sorry for the toilet pic, I was trying to highlight my beautiful, ombre shower curtain! What budget-friendly tips do you have for making over a room? Adorable. I love the paint color. I am in need of fixing up my half bathroom. I really like the cabinet too. I want a similar one for my eat in kitchen. No real room for a tall cabinet. Looks beautiful!! Our bathroom at the apartment that my husband lives in (and where I live on weekends) is awful. I tried to give it a makeover a few months ago but it only helped slightly. I love it! Especially the cake stand! I've been looking for an alernative instead of the bin I have on my counter. Target here I come!